and all kinds of leisure clothes, jacket etc. applicable to sewing of cotton wool, cloth and knitting wear for garment factory. 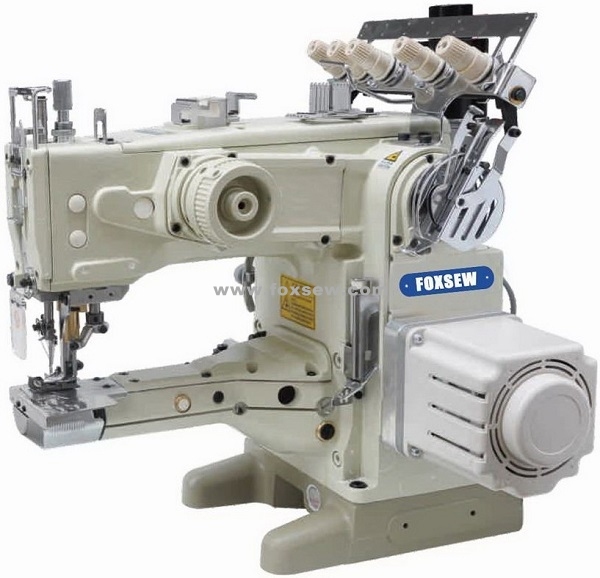 1) This machine is 3 needle, 5 thread interlock machine, can be with upper decoration thread, the stitch is beautiful. fully lubrication, good sealed, clean and environment protection. 4) This machine can realize "one machine multi-function" just by changing the needle plate. from 1:0.8 to 1:2 by knob. of the machine, low noise, low vibration, long working life. 7) This machine is with security equipment of finger-guard, eye-guard etc, can be used safely. 8) This machine can constantly work at speed of 4000r.p.m, high working efficiency.